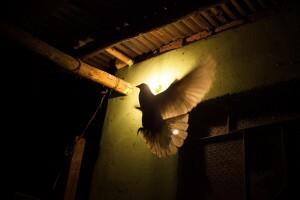 A pigeon flies to its nest at Orlando’s house. Orlando joined Colombia’s second biggest guerrilla group The National Liberation Army (ELN) at the age of seven, after having being raped and rejected by his family. He demobilised over 15 years ago. Cundinamarca, Colombia. 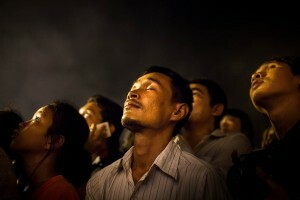 A man closes his eyes in prayer as hundreds of people stare at the moon looking for a resemblance of their King. Phnom Penh, Cambodia. 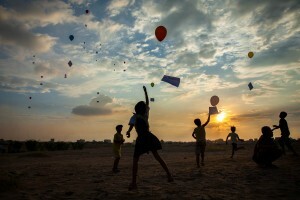 Balloons with SOS messages directed to president Obama and Hillary Clinton while in Cambodia during the ASEAN summit, are released during a demonstration in the sand dunes of the former Boeung Kak lake. Phnom Penh, Cambodia. A young girl helps her father sweep the coca leaves at the local ‘caleta’. “She doesn’t work here, but the kids like to come and hang out,” says her father, Mario. “To us this is the legal stuff, with this we can educate our children, buy them food and clothes, give them health, and there’s even a little bit left for us,” he says. Coca makeshift laboratory. Tierralta, Colombia. 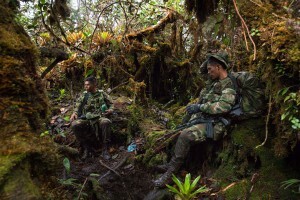 Ground Combat Battalion Soldiers take a break during a massive search for 51 year-old teacher Rosalba Ariza who was kidnapped by men wearing The National Liberation Army’s (ELN) identifying armbands on Nov. 1, 2016. Loaded with more than 50 pounds of equipment and ammunition, the soldiers struggled to catch their breath hiking at more than 3,500 metres of altitude in the Andes’ highlands of Colombia. 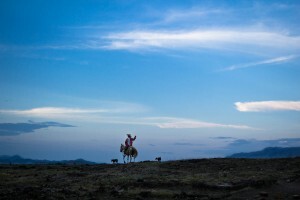 Cauca, Colombia. 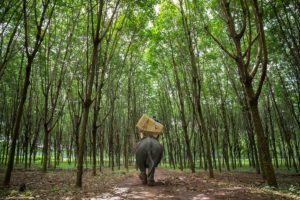 Neang Loung, the female elephant in charge of delivering election materials to one of Cambodia’s most remote polling stations, walks across a rubber plantation in Mondulkiri Province a day before National Elections. 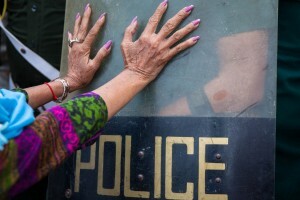 A Boeung Kak resident during clashes with the police near Prime Minister Hun Sen’s house. 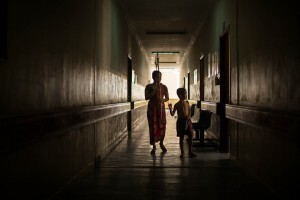 A woman and child walk down the isle from the National Paediatric Hospital in Phnom Penh during the 2012 dengue epidemic. Phnom Penh, Cambodia. 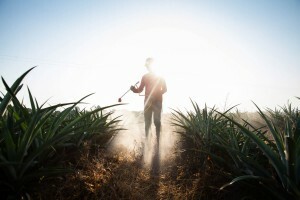 A worker fumigates the pineapples fields at La Fortuna. The productive farm was set up by Humberto and Shirley Aguirre as part of La Esperanza (The Hope), a cooperative where 100 demobilized militants work together to build a better future. “Now, we are not only working for our future, but we provide work to other people from the region” Casanare, Colombia. 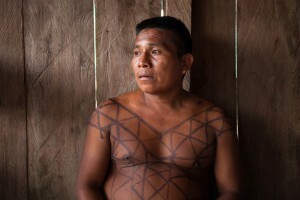 Ornelio Forastero, a 38 year-old leader from the Embera indigenous community in Bacal, Alto Baudó. “We don’t know what really happened, but we heard loud explosions, gunshots. We got scared and ran away, we went up the river and camped on the riverbank for days.” The community has been forcibly displaced for years due to the conflict in the region among illegal armed groups operating in the region. 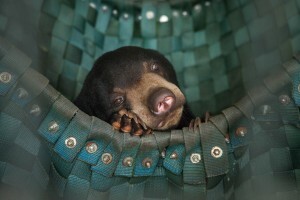 A sun bear takes a nap in one of Free The Bears’ hammocks at the Phnom Tamao Wildlife Rescue Center. David rests on his mother’s chest in kangaroo position, four days after being born. “The method allows the baby to rest and fall asleep deeply, this can never be achieved by an incubator”, says Dr. Charpak from the Kangaroo Foundation. A mother holds her baby in Kangaroo position at the Kangaroo Foundation in San Ignacio Hospital in Bogota. ‘The program helps families feel more competent to help their babies and actively participate in their recovery. Bogota – Colombia. 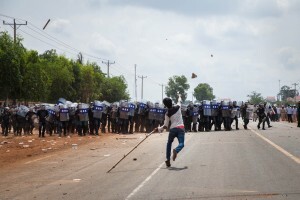 Demonstrators throw sticks and rocks to the police during the clash in front of Sabrina Factory. Workers have been on strike since May 25, 2013 demanding a salary increase.